Born in Illinois in the USA, Kevin Lisch recently got his Australian citizenship and will now get the chance to represent his adopted country at his first Olympic Games in Rio. Lisch headed to Saint Louis College between 2005-09 where he averaged 14 points a game and was recognised as one of the Atlantic 10’s best defensive players. After going undrafted in the 2009 draft he signed with the Perth Wildcats in the NBL. In his first year with the side he helped them win the NBL championship and in doing so won the NBL Finals MVP award. Having been one of the Wildcats best again in the 2010-11 season, he was the best in the league in 2011-12 as he won the NBL’s MVP award after scoring over 17.3 points, 3.7 rebounds and 3.2 assists a game. Following another strong season in Australia he headed to Puerto Rico where he would be crucial in helping Piratas de Quebradillas win the league championship. Stints in France and Spain followed before he returned to the NBL to play with the Illawarra Hawks. He averaged 19.4 points, 3.5 rebounds and 3.3 assists to win his second NBL MVP award as the Hawks went down in the semi-finals. He returned to Piratas de Quebradillas for a short stint before Rio and will link up with the Sydney Kings following his Olympic debut. His son Benjamin was born in Paris, France and daughter Sofia was born in Zaragoza, Spain. His brother and two sisters all played basketball in college as well as my wife, Rachel. 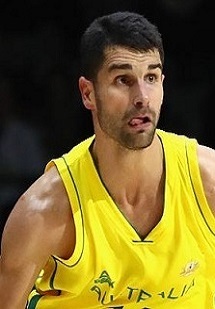 Lisch played 14 minutes per game at the Olympics, helping the Boomers reach the Bronze medal match which they ultimately lost to Spain in heartbreaking fashion.